The NCWIT Aspirations in Computing program engages young women interested in technology and computing. By generating visibility for these young women in their local communities, the program encourages their continued interest in computing, attracts the attention and support of educational and corporate institutions, and emphasizes at a personal level the importance of women’s participation in computing and IT. To learn more about the Aspirations program, please visit their website. 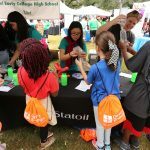 The 2019 Houston Affiliate awardees will be recognized in a ceremony at the University of Houston Downtown and will also be invited to receive additional monetary awards at Energy Day Houston on October 19, 2019.